MTUC secretary-general N. Gopal Kishnam says some employers take advantage of foreign workers by not giving them days off and not paying their wages. – The Malaysian Insider pic by Afif Raiezal, September 28, 2014. The Malaysian Trades Union Congress (MTUC) has blamed the lack of coordination between the Home and Human Resources ministries for the large number of undocumented foreign workers in the country. Its secretary-general N. Gopal Kishnam described the situation as “the right hand does not know what the left hand is doing”. “The MTUC and other specific national unions have repeatedly highlighted this matter to the authorities but it has fallen on deaf ears,” he told The Malaysian Insider. Gopal said this in response to a revelation by Human Resources Minister Datuk Seri Richard Riot Jaem recently that of the 5.8 million migrant workers in Malaysia, only 2.9 million were documented. Describing the dumping of foreign workers as worrying, Riot said Malaysian workers need to change their attitude by not being choosy over jobs or just want to work in the public sector. He said Malaysians should seize job opportunities provided by the 600,000 small and medium enterprises (SMEs) which were currently filled by foreigners. It is believed that at least 35% of the workforce in SMEs are foreigners, especially from Nepal and Bangladesh. Gopal said the Human Resources Ministry’s excuse was that the approval to bring in foreigners was with the Home Ministry and it had no control on the number needed in the country. “They ( Human Resources Ministry) do not even have a ratio of foreign and locals employed in the manufacturing sector,” he said. 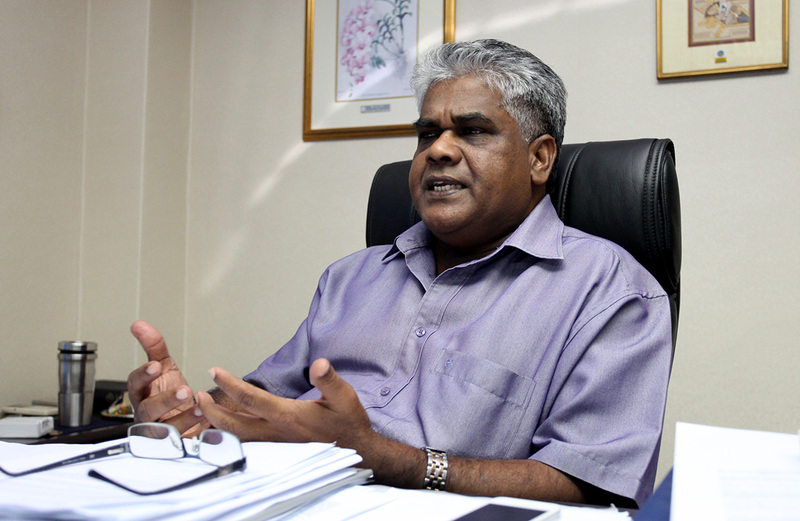 Gopal said investigations conducted by the MTUC revealed that almost all foreign workers entered the country legally but became undocumented employees due to exploitation by their employers. “What was promised at the country of origin was not honoured when they arrived here. Some were paid peanuts,” he said. Even the minimum wage of RM900 per month to workers in the peninsula was not accorded to most foreigners although the policy came into force in January last year. Gopal claimed that employers used underhanded tactics like using gangsters to threaten their workers in order to subdue them or remove them from their hostels. “Some deliberately do not pay their wages for three months. These workers had borrowed money from loan sharks in their county or mortaged their property and livestock to seek employment here,” he said . Gopal said desperate foreigners then would seek employment elsewhere to remit money home and settle their debts. “They will have to remain in the country for at least two years, sometimes working up to 16 hours a day without weekly rest day or paid annual leave. Some also take up additional jobs,” he said. Gopal said for many workers, their problems were compounded when their employers held their travel documents and made police reports that the foreigners had “disappeared”. He said there were adequate laws to act against irresponsible employers but the problem was lack of enforcement. Gopal cited the example of foreign workers who were recruited to work in restaurants, especially in 24-hour outlets. “We had foreigners who sought our assistance when their salaries were not paid and work permits not renewed although levies were deducted from their wages,” he said. He said the Labour Department finally managed to help the workers get all their wages but surprisingly, no action was taken against the employer. “We have asked the department to take action as a deterrent to others but sadly there was no follow-up action,” he said. He also said locals could not be labelled as lazy and choosy because they adapted well in fast-food outlets. “The wages at these places are reasonable and the working hours are flexible,” he said. He added that many Malaysians were working in Singapore and abroad and they have been complimented for their productivity, diligence and enthusiasm. The MTUC is the umbrella body for unions in public and private sectors and statutory bodies and close to 175 unions nationwide are affiliated to it. – September 28, 2014.